Q. Can my monitors go on their sides? There are many reasons why speakers designed to be used in the conventional upright position, as above, should not be positioned on their sides. Amongst other effects, your stereo image will suffer, your sound is likely to become more coloured and less accurate, and surface reflections may increase.As the positioning of my workstation is a bit awkward, it would be great if I could place my KRK VXT8 monitors horizontally. Apart from stereo imaging, are there any reasons why these monitors should not be placed on their sides? SOS Technical Editor Hugh Robjohns replies: There are several technical reasons why turning monitor speakers on their sides isn't generally a good idea, although some speakers are designed to be usable in this way (usually involving turning the tweeter waveguide around, and various other tweaks). The primary aspect is the stereo imaging, as you say. Conventionally, the tweeter and bass driver are aligned vertically so that the sounds from each arrive at the listener at the same time. Turning the speaker on its side will result in sounds from the two drivers arriving at different times. This usually results in a strange, unstable and disconnected stereo image, where the different frequency components of a specific sound source will appear to come from a different place. Generally, you won't be able to reproduce a stable centre phantom image with the speakers configured in this way. Worse than that, however, through the crossover region where both drivers are trying to reproduce the same signals, the different path lengths from each driver to the listener will result in a comb‑filtering effect due to phase cancellation — and the sound will become coloured and inaccurate. This is certainly not what the designer intended, and it significantly reduces the usefulness of the speakers as a reliable, accurate monitoring tool. The colouration will also vary dramatically as you move left and right from the central listening position. Most speakers are designed to have a very wide horizontal dispersion angle to maximise the stereo image width and 'sweet spot' listening area. But to try to minimise the problems of reflections off the console or work surface and ceiling, most also have a relatively narrow vertical dispersion. This dispersion is often controlled by a 'waveguide' built into the baffle around the tweeter, or (less effectively) by the placement of the tweeter relative to the edges of the front baffle of the speaker. By turning the speaker on its side, you reverse the dispersion characteristics, resulting in a narrower than intended 'sweet spot' and stereo image and much worse surface reflections, resulting, yet again, in more colouration, comb filtering and other unwanted effects. Another issue to consider is that, in most cases, the bass driver is mounted some way away from the bottom of the cabinet, and if you place the speaker on its side the bass driver will usually end up much closer to the mounting surface than was intended in the original design. Depending on exactly how the speaker is supported, this could well result in changes to the frequency response through the bass region, moving the performance of the speaker away once again from what the designer intended. Another potential practical issue is cooling. Many powered monitors have finned cooling heatsinks on the rear panel that work by channelling cold air up the vertical fins, like a chimney. Turning the speaker on its side means that the cooling air flow is disrupted and becomes turbulent, significantly reducing cooling efficiency and potentially resulting in the speaker overheating, which could cause protection shut-downs in the short term, and premature component failure in the longer term. Finally, in the case of the VXT8, the curved sides will make it unstable if mounted on its side without some form of cradle to support it properly. So, stability, cooling, frequency response anomalies, surface reflections, crossover colouration and stereo imaging are all affected to some extent. Consequently, I wouldn't recommend mounting your speakers on their sides if you can possibly avoid it. 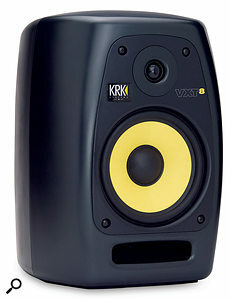 There is usually an alternative solution, such as mounting the speakers on higher stands further back and tilting them downwards towards the listener.